PHILADELPHIA, Pennsylvania— Today was our last full day in Philadelphia, and we were determined to visit the Liberty Bell, that iconic American symbol. On Wednesday we arrived too late, and yesterday we were deterred by a line reaching as far as the eye could see. This was our last chance. This morning's line was just as long, but there was nothing to do but join the line and hope for the best. Within two minutes after we took our spot, a large group queued up behind us, elevating us to the middle of the line. We began to wonder whether it would be worth the wait. 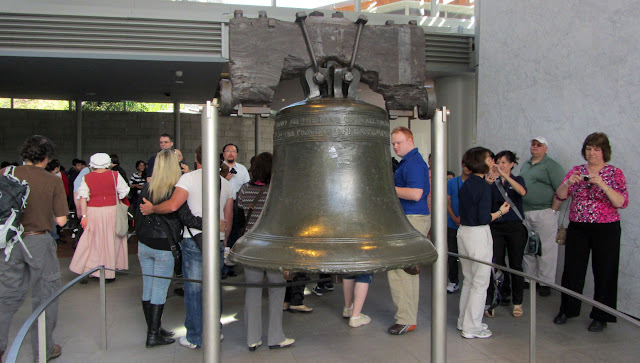 After all, we had seen the bell back in the 1970s when it resided at Independence Hall. Then we heard an experienced teacher behind us reassure his adolescent charges, "Don't worry; this line goes fast." As if to prove him right, the line suddenly began moving forward. Within five minutes, we had moved from place 153 in line to place 1, as security personnel sped through perfunctory inspections of our bags. Once inside, we found the exhibits informative and creative, not to mention almost too thorough. After navigating through about five sections of displays, we looked at each other and said, "Are we ever going to see that bell?" Fortunately the answer was around the next corner. Ordered from England for the Pennsylvania State House (now known as Independence Hall) in 1751, the bell was rung for public announcements. On July 8, 1776, the ringing announced the first public reading of the Declaration of Independence. Immediately recognizable by the distinctive line from its shoulder to the lip, the bell cracked soon after it arrived in Philadelphia. Local craftsmen created a mold and recast the bell, reusing the metal from the English bell. According to the ranger at the center, this bell cracked also and was recast a third time, using the same material. When bell #3 was rung in celebration of George Washington's birthday in 1846, a small crack in that version of the bell erupted into the fissure visible today. 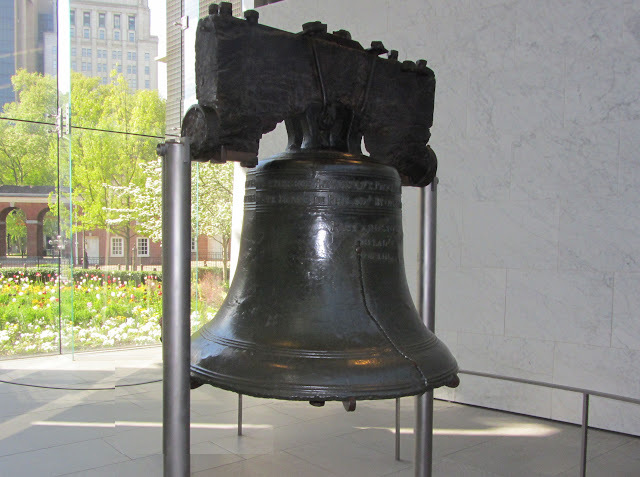 The bell was not recast, nor has it been rung again, but it remains a symbol of liberty in America and around the world. Liberty was the theme of the day as we moved just across Chestnut Street to the Historic Philadelphia facility for a showing of Liberty 360. A program of the non-profit Historic Philadelphia organization, the show is promoted as "full 360 degree, 3-D movie experience." Well, no, not exactly. Hosted by Benjamin Franklin, the film never really takes advantage of 3-D technology until a special effect near the end, which also happens to be the only time the image reaches 360 degrees. Though "spectacular" would be a bit of an exaggeration, the 15-minute show had a few "that was cool!" 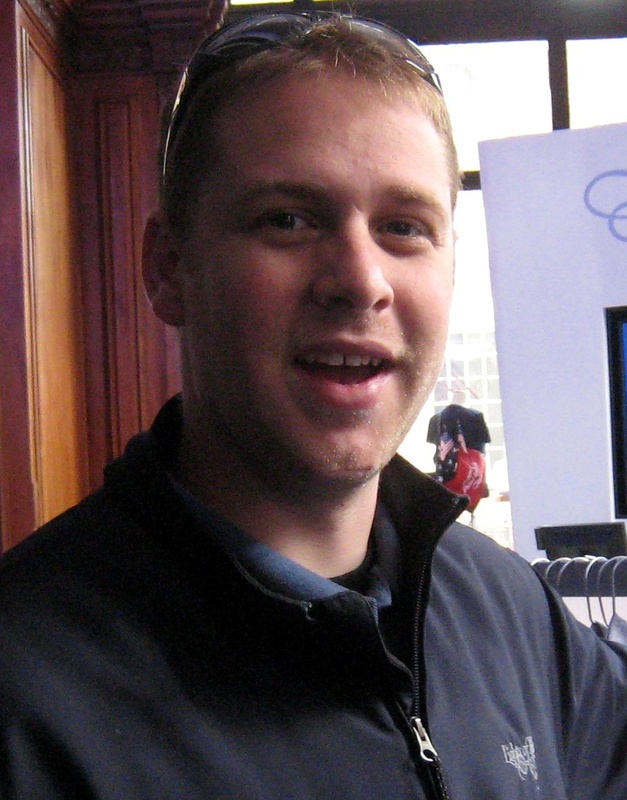 moments and provided information about United States symbols in an entertaining manner. For kids nurtured on video games, this would be a good pick. It's fast-moving and has enough special effects to keep the action addicts engaged. Though not the free bargain of the NPS properties nearby, the $5 (senior) admission fee didn't feel excessive for the production. 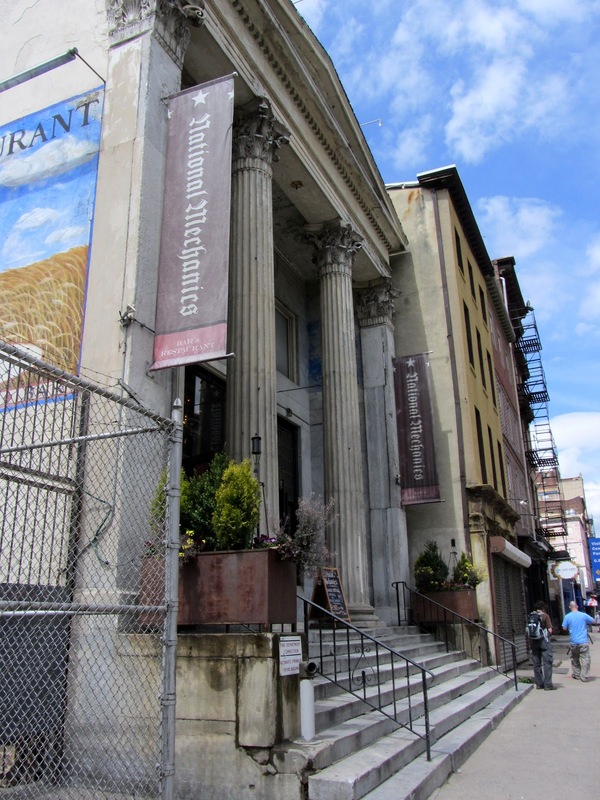 As an added bonus, we had an congenial conversation with one of the friendly staff members, who not only gave us an excellent suggestion for a lunch location but comped us some free tickets to the eerie Eastern State Penitentiary museum. Thanks! 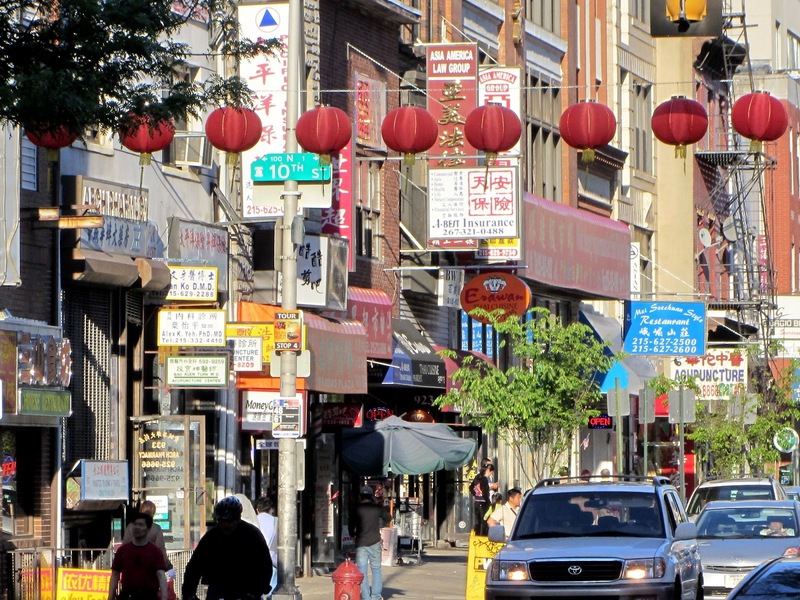 You're a great ambassador for Philly. 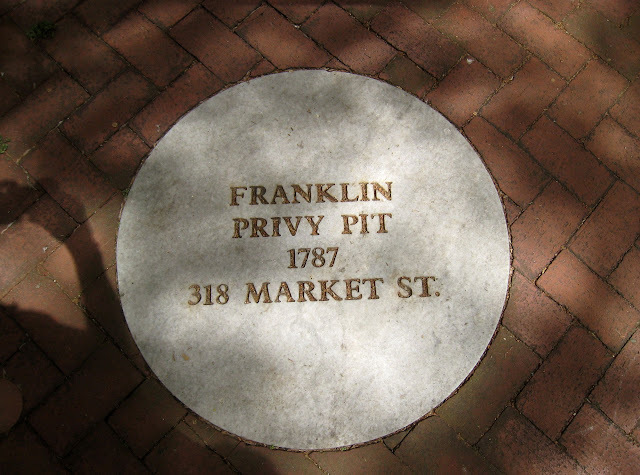 Stopping briefly by Franklin Court, the site of the only home Benjamin Franklin ever owned, where visitors can view demonstrations of some of his inventions and innovations, we were a bit surprised to see an engraved marble marker indicating the location where the Franklins uh, er, took care of their business. Happily there was no lingering aroma after 225 years. Back to the theme of the day, we paid a visit to the National Museum of Liberty. We knew it was not part of the NPS properties, but that's about all we knew. Again, admission was only $5 each (senior price), so we decided to give it a try. Forty-five mind-numbing minutes later, we staggered away with an understanding of what a personal project gone awry can become. Though it name suggests a very specific aim, the museum's exhibits were erratic in focus. Repeatedly, the hyped interactive nature of the displays seemed to require the visitor to deduce how a particular topic related to liberty. 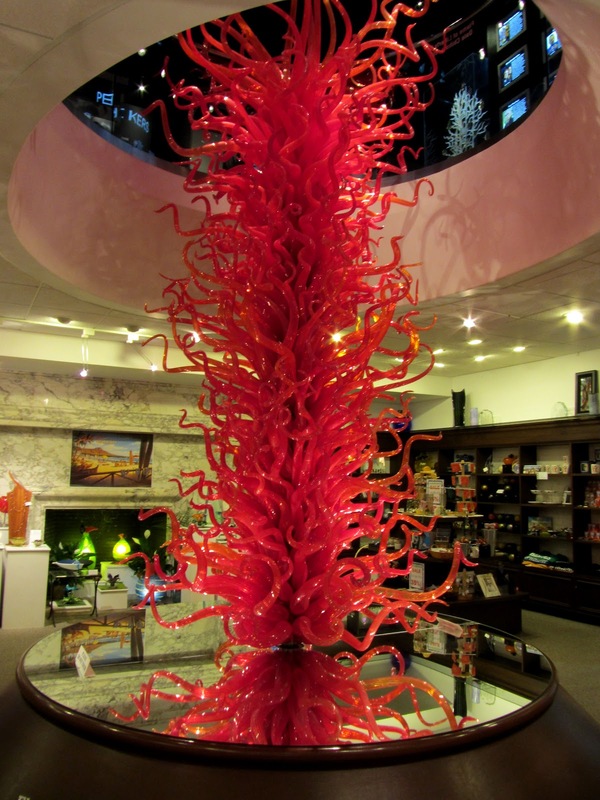 A prime example is the pervasive glass art, which is apparently a special interest of museum founder and owner Ivan Borowsky. The centerpiece of the glass collection is a stunning 20-ft scarlet Flame of Liberty sculpture by Dale Chihuly, which is inexplicably exhibited in the museum's gift shop. 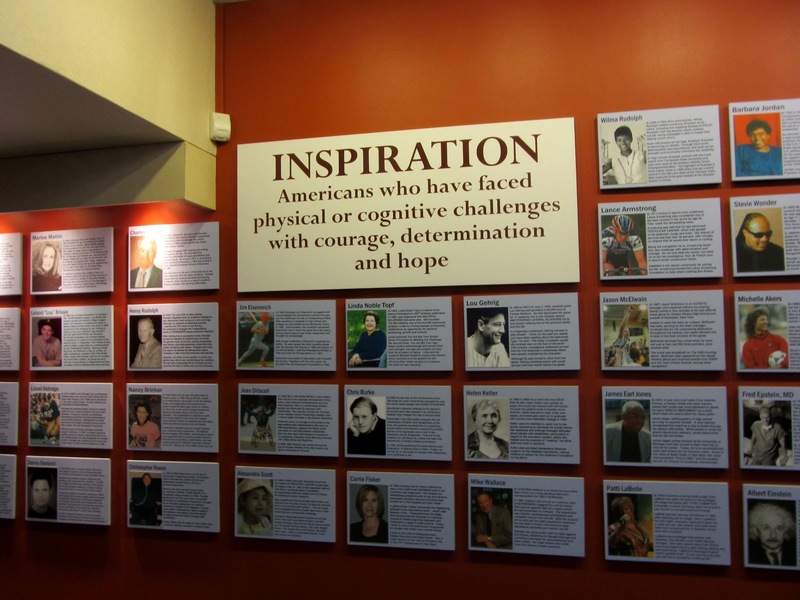 Many of the exhibits are merely posters detailing information about various individuals whom Borowsky finds admirable, including himself, portrayed as an "inspiring success story" of an immigrant who made good in America. 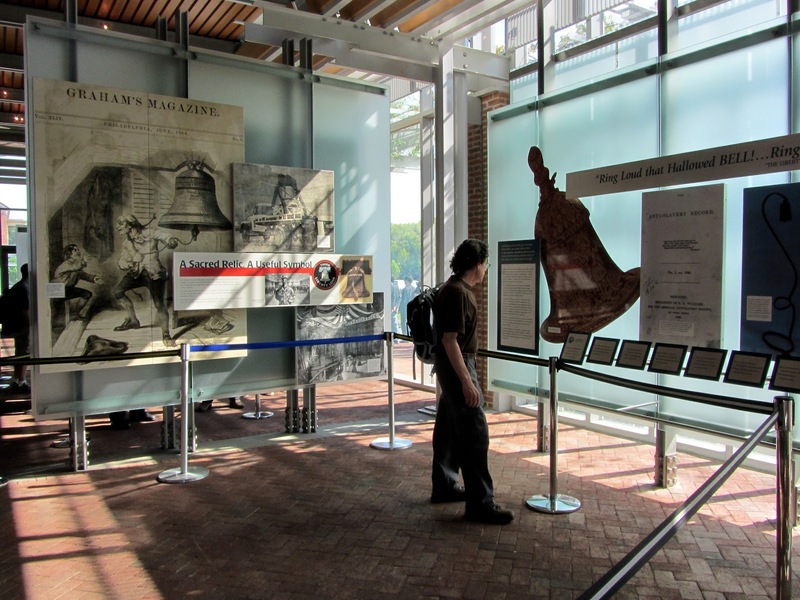 To read the enormous amounts of information presented on the posters would require a visit of at least 18 hours. Children's overexposure to violence, people who have overcome difficulties, conflict resolution, children made from jellybeans. Time and again, we tried to make the connection between the sometimes odd topics and the theme of liberty. 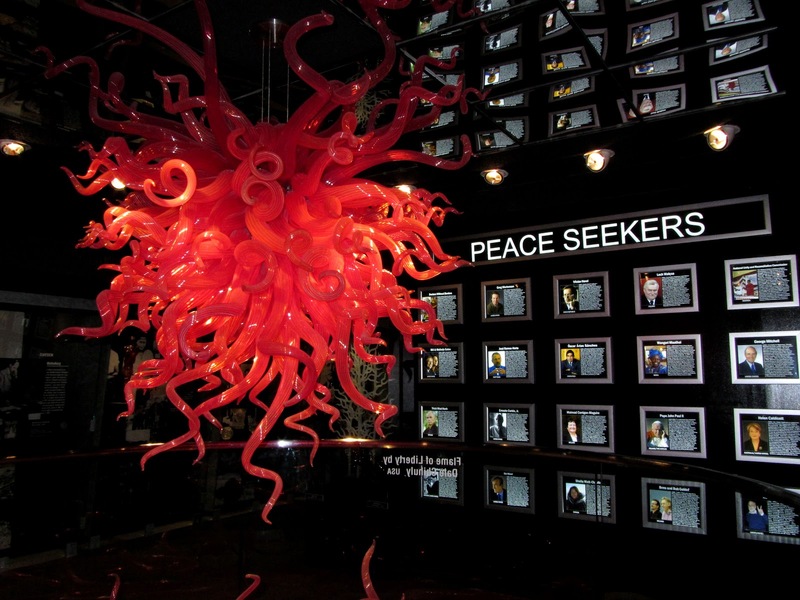 We finally found our answer later when we discovered a statement made by the museum's founder and chairman: "The museum is a reflection of my life experiences and fear of escalating violence in America." Oh, so it really wasn't supposed to be about liberty, after all. Never mind. 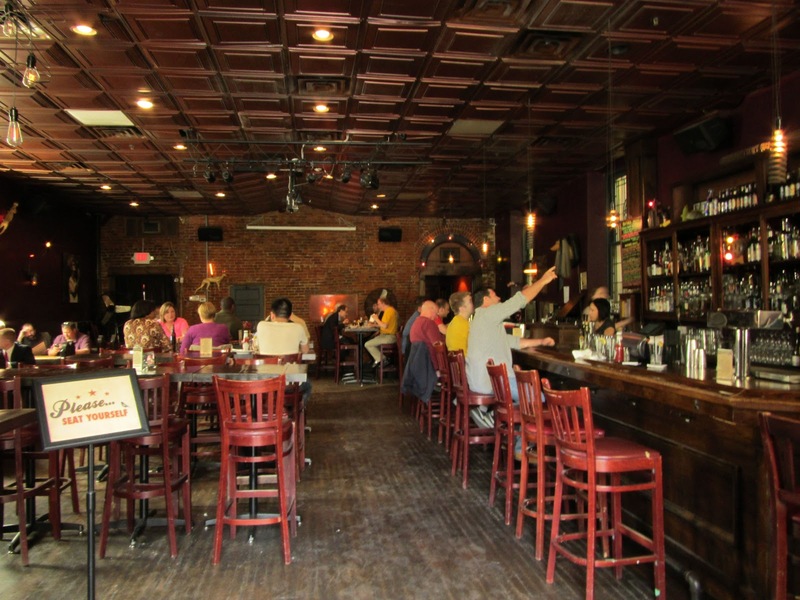 With sound advice from our pal at Historic Philadelphia, we visited a local gastropub in the historic district. National Mechanics, so named because it's located in the 1837 Mechanics National Bank building, claims to offer "the single greatest veggie burger in the known world" based on an ancient recipe formulated by Mayan mathematicians. While we might take issue with the Mayan myth, we have to agree that it was a sensational veggieburger. Service was friendly and timely, and the cost was reasonable. 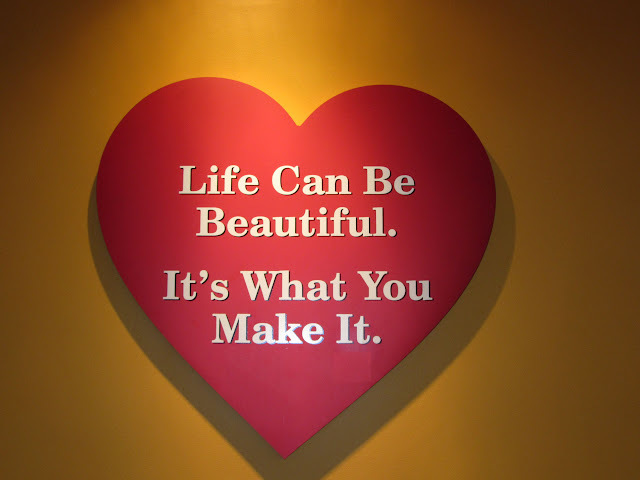 That's about all it takes to make us happy. Our final stop of the day was the facility the National Park Service calls the Declaration House. 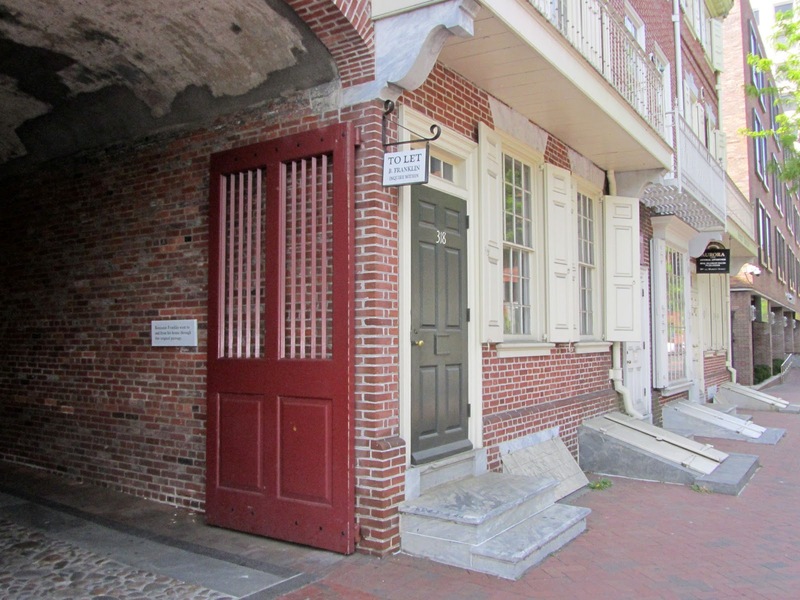 When the Second Continental Congress met in Philadelphia in 1776, Thomas Jefferson was appointed to a committee asked to draft a declaration explaining why the colonies were moving to sever ties with Great Britain. That committee assigned Jefferson the task of creating a draft document for them to consider. 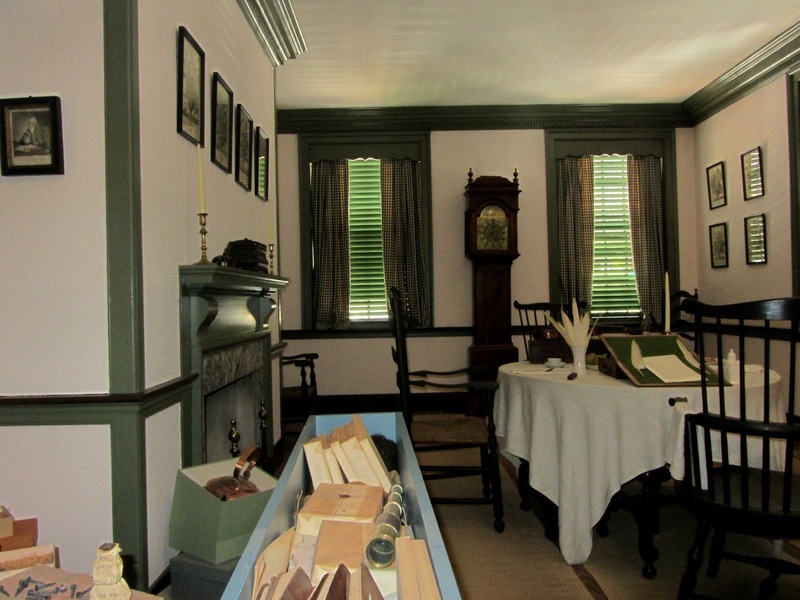 Distracted by the noise and heat of his lodging downtown, Jefferson rented rooms in a house at the outskirts of the city, where he labored in a quieter atmosphere for three weeks as he penned the first version of the Declaration of Independence. Though the original structure where Jefferson worked was dismantled in the late 1800s, a faithful reproduction sits on the spot, including replicas of the bedroom and sitting room that Jefferson occupied. As we wound down our last full day in Philadelphia, we realized that we had never tried the local subway system. 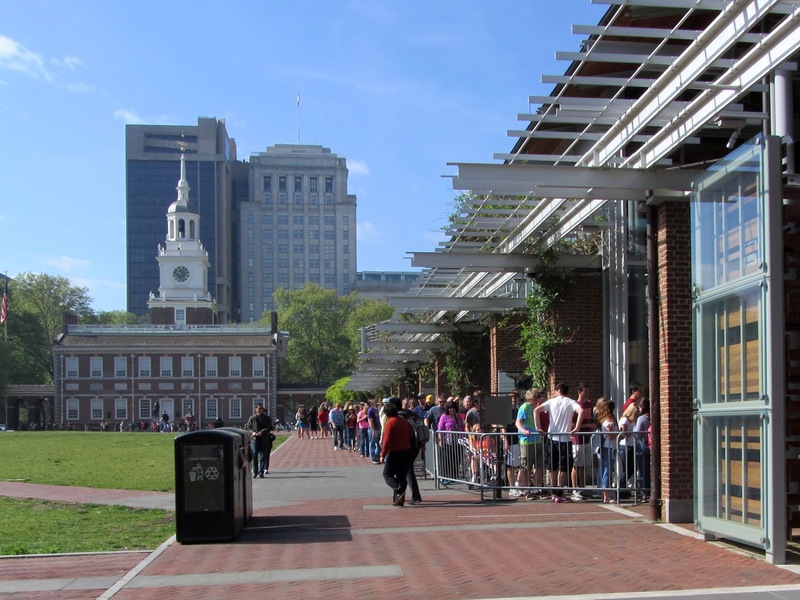 From our city center hotel near the Convention Center, Independence Mall was an easy half-mile walk away. 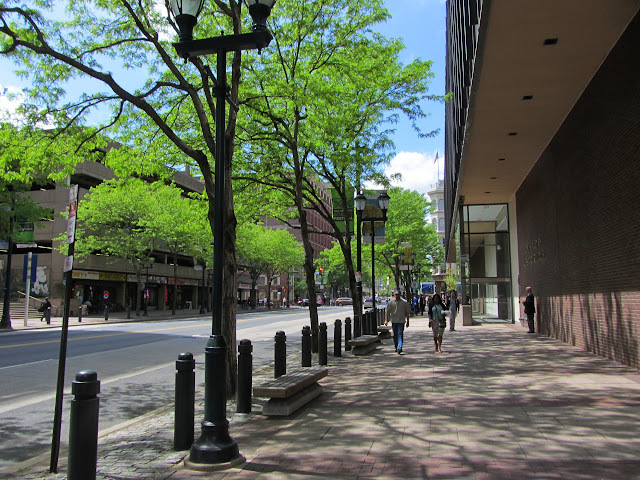 With most of the other significant sites within a few blocks of there, we have found our historical touring of Philly to be a very walkable proposition. Often sidewalks are wide, and in this area are kept quite clean. 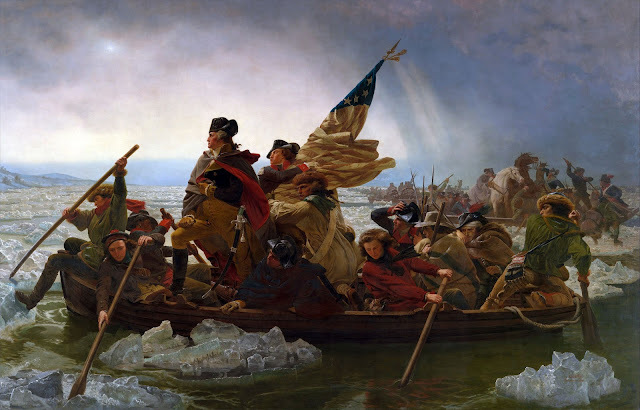 Tomorrow we'll be back in the car as we leave Philadelphia and cross the Delaware into New Jersey. Let's hope our crossing is a bit less dramatic than another one that comes to mind.